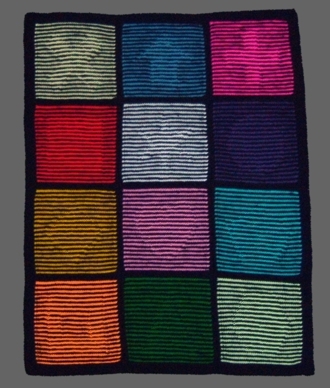 This blanket consists of twelve blocks, each with a different illusion shape. These shapes are very easy to make. 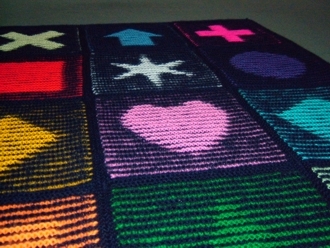 The blocks can be used in any combination so you could choose to cover the whole blanket with the same shape, if you wish. The blanket shown is baby size. 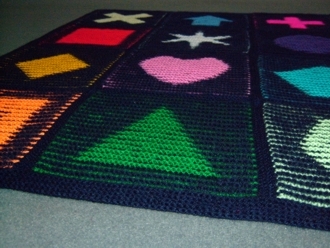 Add more blocks or wider borders to make a bigger blanket. You could also use individual blocks for many other purposes, such as for a bag, cushion or the back and front of a child’s sweater. This is what you see when you look straight at the blanket. Arrange the colours in a pattern of your choice. The photos below show close-ups of some blocks.